The traditional Uzeyir Hajibeyli International Music Festival is an oasis for classical music lovers. The music lovers meet every year in Baku to enjoy the best works of world-renowned compositors and honor memory of Uzeyir Hajibeyli, the founder of Azerbaijani music. The 9th edition of the Festival kicked off on September 18, celebrated as the Day of National Music in Azerbaijan. During a week-long festival, alongside national musicians, outstanding performers, orchestras from many countries demonstrated their skills, performing in the best concert halls of the capital. 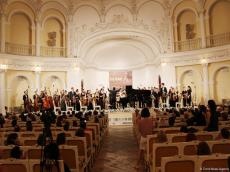 The festival ended with a concert of the Munich New Philharmonic orchestra under the patronage of Fuad Ibrahimov. The orchestra begin the program with the overture to the Opera "Ruslan and Lyudmila" by Mikhail Glinka. The music sounded very soulful, striking the hearts of the listeners. Further, the director of the State Philharmonic Society, People's Artist of Azerbaijan Murad Adigozalzade was invited to the stage under stormy applause of the public. Together with the musicians of the orchestra, Murad Adigozalzade performed Concerto No. 2 for pianoforte and orchestra by Sergei Rachmaninov. From the first chords the pianist literally charmed the audience. The enchanting performance amazed the audience. The orchestra also performed the symphonic suite "Scheherazade" by Nikolai Rimsky-Korsakov. The final day of the 9th International Music Festival dedicated to the great composer Uzeyir Hajibeyli was remembered with virtuoso performances, incessant applause, a full house and delight of grateful public. Born in 1885 in the heart of the ancient Azerbaijani Khanate of Karabakh -- Shusha -- Uzeyir Hajibeyli’s outstanding musical talent started a revolution in the Azerbaijani musical timeline. He was the very musician to introduce an extraordinary innovation in the nation's music culture, to constantly refresh it, and adjust to modern tastes. He was a founder of an opera genre not only in Azerbaijan, but the East and created the first Muslim opera in the Islamic world. His unique synthesis of Oriental and Western music significantly promoted the classical music traditions in the East and opened a page of classical music patterns. The unique composer was brave enough to explore blending two incompatibly different cultures at root and achieve an unprecedented synethesis. History recognizes Hajibeyli as an innovator as well as the first to establish a professional music school and Orchestra for Traditional Folk Instruments, to compose the Muslim world’s first opera and operetta, to introduce a woman on stage, to write the country’s national anthem (which is the official anthem of Azerbaijan today), to be awarded the highest artistic title of the Soviet Union. Hajibeyli occupied himself in almost every facet of music culture, and was a great conductor, publicist, playwright, teacher, and translator.